Perched high on a bluff above the Potomac River in the historic town of Shepherdstown, the Bavarian Inn is a romantic country inn that exudes European elegance and Old World charm. Owned by the Asam family, this inviting bed and breakfast-style inn is surrounded by beautifully manicured gardens and offers luxurious accommodations, gourmet dining, first-class facilities, and world-class service. Boasting breathtaking views over the river, the award-winning, alpine-style inn features 72 luxuriously appointed guest rooms with cozy gas fireplaces, private bathrooms with whirlpool baths and modern amenities while the pristine grounds have an infinity swimming pool, tennis courts, and several excellent dining options. Located in Shepherdstown, the Bavarian Inn is conveniently situated within close proximity to Harpers Ferry and the Antietam Battlefield, while Baltimore and Washington, D.C. are only an hour away. Established in 1734 by Thomas Shepherd, Shepherdstown is the oldest town in West Virginia and has a deep-rooted heritage. Originally named Mecklenburg in 1762, the town was later changed to Shepherdstown in honor of its founder and was home to a large number of German settlers. A German school was founded in the town as early as 1762 and the main street is still called German Street to this day. Shepherdstown is renowned for being the birthplace of the Steamboat in 1787 by James Rumsey and is commemorated by the Rumsey Monument that stands in the center of the town. Shepherdstown is also in the middle of a historic Civil War area and home to several famous sites, including the Antietam Battlefield, where the Civil War’s single most bloody day of battle was fought, and the town of Harpers Ferry, famous for being the place where the abolitionist John Brown was captured. This small college town has a population of 1800 and is home to an eclectic collection of beautifully preserved old homes, quaint boutique and stores, and inviting coffee shops. Elegantly appointed alpine-style chalets overlooking the Potomac River Bend feature beautifully-appointed guest rooms with luxurious furnishings, modern amenities, and lovely views. Individual guest rooms enjoy ample sitting rooms with comfortable décor, cozy gas fireplaces and private en-suite bathrooms with deluxe whirlpool baths. All guest rooms have modern amenities, including flat-screen HD televisions with Direct TV and premium movie channels, direct dial cordless telephones, iron and ironing boards, hair dryers and plush bathrobes, in-room coffee makers with coffees and teas and complimentary high-speed wireless Internet. A nightly turndown service and luggage assistance can be arranged on request, and extra guest services include chocolate-covered strawberries, and fruit and cheese platters. Combining old world elegance and classic charm with new age comforts, suites at the Bavarian Inn offer a truly luxurious experience with antique furnishings, gas fireplaces and spectacular Potomac River views. Suites feature king-size beds with imported linens and private en-suite bathrooms with glass-enclosed showers, double Jacuzzi bathtubs, plush bathrobes and deluxe bath products. Spacious sitting areas have comfortable sofas, coffee tables, and gas fireplaces and modern include flat screen HD televisions with Direct TV and premium movie channels and complimentary high-speed wireless Internet throughout. Guests are treated to complimentary champagne on arrival and added guest services include chocolate-covered strawberries, and fruit and cheese platters on request. 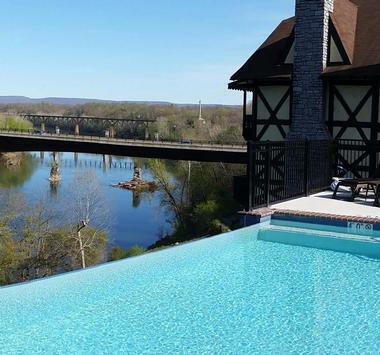 Located in one of four chalets set high on a bluff above the Potomac River, Potomac River View Rooms feature separate bedrooms and sitting areas, and private balconies with gorgeous views. River View rooms offer king-size beds in luxurious linens, and private en-suite bathrooms with glass-enclosed showers, whirlpool baths, plush bathrobes and deluxe bath products. Sunny living areas are decorated with elegant furnishings and modern amenities, including gas fireplaces, flat screen HD televisions with Direct TV and premium movie channels and complimentary high-speed wireless Internet. Extra comforts include in-room coffee makers with coffees and teas and a nightly turndown service on request, and a private balcony offers a quiet place to relax. Located in the Schwarzwald Haus (Black Forest building), Garden View Rooms boast private balconies with beautiful views of the manicured gardens and the 1930s Grey Stone Mansion. These rooms feature ‘centre-style’ designs with queen-size beds in fine linens, private en-suite bathrooms with glass-enclosed showers, whirlpool baths, plush bathrobes and deluxe bath products, and separate living areas with gas fireplaces and comfortable sleeper sofas for extra guests. The Bavarian Inn offers several dining options based in the beautifully restored, 1930s-built Greystone Mansion. Nestled on a sprawling 12-acre estate, the Greystone Mansion is home to several dining rooms that serve award-winning American and German cuisine in a warm and welcoming setting with dark wood finishes, ornate stone fireplaces, and elegant antique furnishings. Dining rooms include The Potomac Room that boasts breathtaking views of the estate’s manicured grounds; The Hunt Room, which is decorated in a true Bavarian style with a massive stone fireplace and antler chandeliers; and the Rathskeller, which offers a richly paneled traditional pub ambiance in which to enjoy weekly entertainment and after-dinner drinks. The Greystone Mansion dining room is also open for breakfast and Sunday brunch and guests can dine alfresco style on the outdoor patio and terrace in the warmer summer months. During the summer season, a casual menu of appetizers, freshly made salads, sandwiches and handcrafted cocktails are served poolside at the Infinity 101 Pool and Pool Bar. 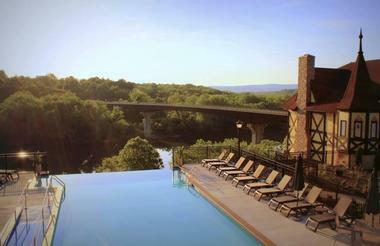 Amenities at the Bavarian Inn include an infinity swimming pool with poolside bar, a state-of-the-art on-site fitness room and access to an extensive off-site fitness center, several dining options at the magnificent Greystone Mansion, and an array of recreational activities and attractions. 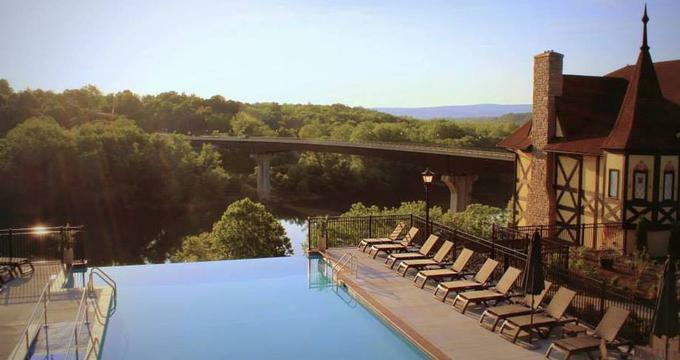 Appropriately named, the Infinity 101 Swimming Pool has a cascading edge that hangs exactly 101 feet above the Potomac River edge and offers a spectacular place to relax. The Infinity 101 Pool and Pool Bar serves a casual menu of appetizers, freshly made salads, sandwiches and handcrafted cocktails that can be enjoyed against a backdrop of exquisite views. Located on the ground floor of the Schwarzwald Building, the Bavarian Inn Fitness Room offers a range of modern equipment for staying healthy and fit, including cardio machines, free weights, and stretching areas. Guests also have access to the new Shepherd University Wellness Center, which is home to a mile track, basketball courts, exercise machines, and a free weights section. The Bavarian Inn offers a selection of modern and elegant venues for various functions, including meetings, corporate retreats, and special events like weddings. The Inn features 7500 square feet of flexible meeting space, which can be configured to cater for different group sizes of up to 150 guests, alongside award-winning dining, luxurious guest rooms and over 11 acres of pristinely manicured lawns and gardens. The Inn also provides a professional conference services department to help with all the details from audio visual needs to team building exercises and activities. Corporate and wedding packages include services such as beautifully furnished venues, events planning groups, individual themes, customized menus and catering options, florists or music, audiovisual equipment, and photographers. Extra guest services for wedding couples include champagne on arrival, chocolate covered strawberries, and fresh fruit platters in guest rooms. Located in the historic town of Shepherdstown, the Bavarian Inn is nearby to a wealth of interesting historical and cultural attractions, recreational activities and exciting adventures. Shepherdstown is the oldest town in West Virginia and has a rich heritage. Explore the history of this fascinating region and area with visits to the Rumsey Monument, a monument built in honor of James Rumsey, the founder of the steamboat engine; the Historic Shepherdstown Museum and the Shepherdstown Visitors Center. Slightly further afield from the Inn is the Antietam Battlefield National Park, which is famous for being the site of the single most bloody battle in the Civil War and the town of Harpers Ferry, which is renowned for being the place where the abolitionist John Brown was captured. Hike up to the top of Maryland Heights for spectacular panoramic views of the Potomac and Shenandoah Rivers. Outdoor recreation activities in the area range from walking, hiking and mountain biking on the famous C&O Canal Towpath, which runs from Cumberland in Maryland to Washington, D.C. There are several championship golf courses close to the Bavarian Inn for guests to enjoy. Guests have exclusive VIP access to play at the Cress Creek Country Club, which is just a quarter of a mile from the Bavarian Inn and features an 18-hole, Par 72 course with beautiful scenic views. The award-winning Locust Hills Golf Course is a 20-minute drive from the Inn and offers special packages for golfing groups staying at the Bavarian Inn.